The Federation Internationale de Football Association has announced the Round of 16 bracket for the 2018 World Cup. Countries from around the world have been competing all season for a chance to claim their place in this tournament. Four countries competed in each Group (A-H). The two teams with the most points by the end of Group matchups moved on to the Round of 16. Here’s a recap on those group matchups and what to expect next. The first matchups were Russia vs. Saudi Arabia June 14 and Egypt vs. Uruguay June 15. Russia came away easily with a 5-0 win over Saudi Arabia. However, the game of Egypt vs. Uruguay was quite a site to watch. Neither team could get the ball past their opponent’s goalkeeper in the first half. Some costly mistakes, off passes and missed shots had both teams hungry for the first goal of the matchup. Egypt’s goalkeeper Essam El-Hadary, who just became the oldest player in the history of the World Cup at 45-years-old, made some incredible saves. In the 83rd and 88th minutes, he dove and hit away two direct shots on goal. The Uruguay offense wasn’t ready to let this game go to a draw with no points awarded to either team in the first matchup. In the 89th minute, a header shot got past El-Hadary giving Uruguay the win 1-0. In the second matchups, Russia played Egypt June 19 and Uruguay played Saudi Arabia June 20. Russia earned another three points against Egypt by winning 3-1, and Uruguay also took a win from Saudi Arabia 1-0. For the third matchups, Saudi Arabia played Egypt and Uruguay played Russia June 25. Although Saudi Arabia took the win against Egypt 2-1, it wasn’t enough for either team to move on to the Round of 16. The game between Uruguay and Russia was a little more interesting. With Russia already securing their spot in the Round of 16, this was Uruguay’s opportunity to take that next spot in Group A. In the middle of the game, after a sliding tackle from a Russian player, Russia was given a yellow card for the play initially, but then the referee held up a red card. The game was downhill from there as Uruguay would come away with the win 3-0 and a spot in the Round of 16. The first round of matchups was Morocco vs. Iran and Portugal vs. Spain June 15. Morocco’s defense played extremely well against a strong Iran offense, and neither team could score a goal in the 90 minutes of regular time. After another six minutes of added time, Iran finally hit a shot past the Moroccan defense and goalkeeper to give them their first point in group play. Cristiano Ronaldo has been the star player from Portugal all season, so it was no surprise that he would score the first goal of the game for his team early in the first half. In this game, he became the first player ever to score in eight consecutive major international tournaments and the fourth player in history to score in four different World Cups. Spain tied the score 1-1 as Diego Costa managed to get the ball around three Portuguese defenders and past the goalie. In the 44th minute, Ronaldo scored again to take the lead going into halftime. Costa would tie it up again 2-2 in the 55th minute of play. It seemed like these two strikers were going head-to-head. About three minutes later, a Spanish defender Nacho would give Spain the lead 3-2 with a goal of his own. Later, in the 88th minute, Ronaldo would come back to score another goal for Portugal for a hat trick and leave the game in a draw 3-3. The second round of matchups was Portugal vs. Morocco and Iran vs. Spain June 20. Portugal and Spain each took the wins 1-0 against their opponents. 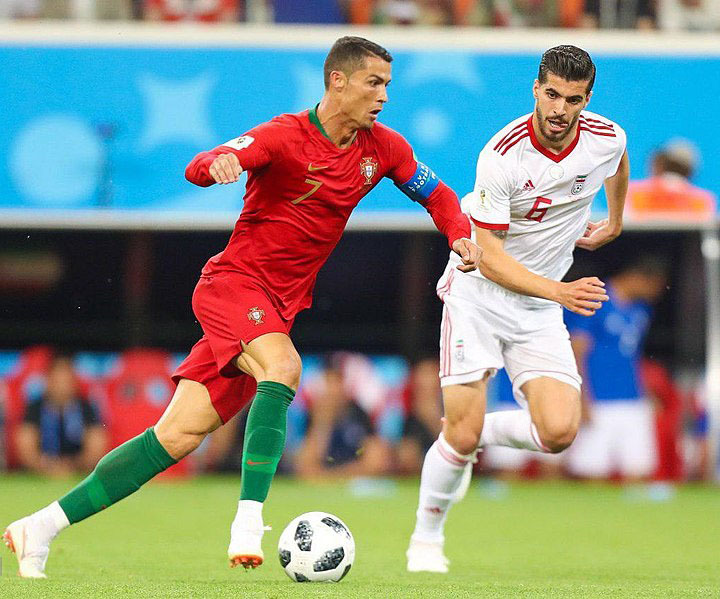 The third round of matchups ended with two ties between Iran and Portugal, 1-1, and Spain and Morocco, 2-2. Spain and Portugal have now moved onto the Round of 16. In the first matchup, France played Australia and Peru played Denmark June 16. Denmark defeated Peru 1-0. After a sliding move from Australia, France was given a penalty kick in the 58th minute that gave them the first goal of the game by Antoine Griezmann. Just a few minutes later, Australia tied it up 1-1 with a goal from Mile Jedinak. A final shot from France’s Paul Pogba which was deflected by Australia’s Aziz Behich hit the top of the goal post and bounced directly towards the group just a foot into the net. The goalie captured the ball quickly but the sound of the whistle from the referee awarded the goal to France after a technology review. The second round of matchups were Denmark and Australia, which ended in a tie 1-1, and France and Peru, where France took the win 1-0, June 21. The final matchups of group play were Australia and Peru and Denmark and France June 26 to decide the two teams to move on. Peru won their matchup 2-0 against Australia, but this didn’t give them enough points to move on. Both Denmark and France moved on to the Round of 16 after a scoreless game. Argentina played Iceland June 16 for the first time in history in group play for the World Cup. Argentina came in as the favorite to win their opening game as they have done in the last six editions. But Iceland came with a fight and the game ended in a tie 1-1. On the same day, Croatia and Nigeria also had their first ever matchup together. Croatia, who is known as a team to produce red cards and lose the opening game in group play, came out on top to win 2-0. Croatia’s next matchup was with Argentina June 21 who they also held scoreless for another win 3-0. Nigeria played Iceland June 22 for their first win in group play 2-0. The third round of matchups placed Nigeria against Argentina and Iceland against Croatia June 26. With Argentina as a favorite in the World Cup, they needed this win to secure a spot in the Round of 16. Croatia had the top spot in the group and showed their dominance by defeating Iceland 2-1. For the first time since 1998, Serbia came away with the win in the opening matchup against Costa Rica June 17 as they won 1-0. In the other matchup with Brazil and Switzerland, the teams tied 1-1. This was the first time since 1978 that the Brazil team did not win their opening game. Brazil came back to win 2-0 against Costa Rica in the second round of matchups while Switzerland defeated Serbia 2-1 June 22. However, it wasn’t just the win for Switzerland that drew recognition to the game. In a celebratory act in which two Swiss players, Granit Xhaka and Xherdan Shaqiri, put up what looked to be like a bird’s wings with their two hands, thumbs linked together, was interpreted by many, including FIFA, as display of the double-headed eagle on the Albanian flag. Because of this, FIFA has filed disciplinary charges against the two Swiss players. The Switzerland team moved on to play Costa Rica for the final matchup in group play. The game ended in a draw 2-2, and Switzerland moved on to the Round of 16. Serbia needed to play extremely well against a powerhouse like Brazil in order to move on to the Round of 16. However, Brazil took the win 2-0. This was unfortunate for Serbia as they have never qualified for the Round of 16 in the three editions of the World Cup that they have participated in since becoming an independent nation. In the first matchup, the reigning World Cup champions from Germany played the team from Mexico June 17. Mexico stole the win away from Germany, 1-0, making this the third consecutive time the reigning champion team has lost the opening match. Sweden defeated South Korea June 18 in the first round of matchups. The Swedish team is unbeaten in their past five games against South Korea with three wins and two draws. This was South Korea’s first loss in the opening game of group play at the World Cup since 1998. The second round of matchups saw Mexico defeat South Korea 2-1 June 23 and Germany defeat Sweden also by a score of 2-1 June 23. Germany’s Jerome Boateng was given a red card during the game leaving Germany with only 10 players. An amazing goal from Toni Kroos gave Germany the win. The final matchups of Group F were ones for the ages. Sweden and Mexico faced off, and Sweden won 3-0 June 27. Both Sweden and Mexico moved on to the Round of 16. In the final matchup between South Korea and Germany, South Korea knocked out the defending World Cup champions with a decisive defeat of 2-0 June 27. Kim Young-gwon had the first goal of the game, but the goal was initially not awarded until the referee viewed the replay and overturned the call. Then, a few minutes later, South Korea scored again which officially knocked Germany out from the Round of 16. In the first matchup, Belgium easily defeated Panama 3-0 while England took the win against Tunisia 2-1 June 18. These teams moved on to the second round of matchups with Belgium earning another important win against Tunisia 5-2 June 23 and England claiming an easy victory against Panama 6-1 June 24. The final matchups occurred June 28 between England and Belgium, and Panama and Tunisia. Belgium took the win from England 1-0, but both teams will move on to the Round of 16. Unfortunately, neither Panama nor Tunisia will move on even though Tunisia took the win 2-1. Colombia and Japan faced off in the first round June 19, and Japan won 2-1. The team from Japan are the first Asian team to win against a South American team during the World Cup. Senegal defeated Poland 2-1 June 19. They moved on to play Japan June 24. This game ended in a draw 2-2. The other matchup June 24 was between Colombia and Poland. Colombia held Poland scoreless and won 3-0. Colombia then defeated Senegal 1-0 June 28 and are now in the Round of 16. A final game between Poland and Japan resulted in a Polish win 1-0, but Japan moved onto the Round of 16 after scoring enough points in previous matchups. The first games in the Round of 16 begin June 30. France and Argentina face off at 10 a.m. and Uruguay and Portugal play in the afternoon at 2 p.m. My picks: France and Portugal for the quarterfinals. The next set of games are July 1: Spain vs. Russia, and Croatia vs. Denmark. My picks: Spain and Croatia. Brazil will play Mexico and Japan will play Belgium July 2. My picks: Brazil and Belgium. The final games of the Round of 16 are Sweden vs. Switzerland, and Colombia vs. England July 3. My picks: Switzerland and England. With only one game in each round from now until the champions are crowned, it will be interesting to see which teams rise to the occasion and who will be named the next World Cup champions.